Connie Francis sang this famous song from another era, that spoke to teen angst and love in 1950’s America. It spoke to the hope that everyone has – women AND men – that someone special is waiting out there just for you. And in the Logistics industry for the longest time the biggest challenge has not been so much trying to find where the loads are – because they are at and on the docks, either waiting to be picked up or having just been dropped off – but where you could find a truck, AND when. But now, there is an answer to that with a new service from Tailwind Transportation Software and Trucker Tools: the new Smart Capacity service, that gives customers the ability to track the location, the progress and the expected time of arrival of the truck – AND the location of other trucks that can help you cover your loads. Tailwind is pleased to announce that it has built an integration of the Trucker Tools platform into its industry-leading, web-based transportation management software program that will give Brokers and Broker/Dispatchers the ability to track the what, when, where and time of arrival of the truck to a location. 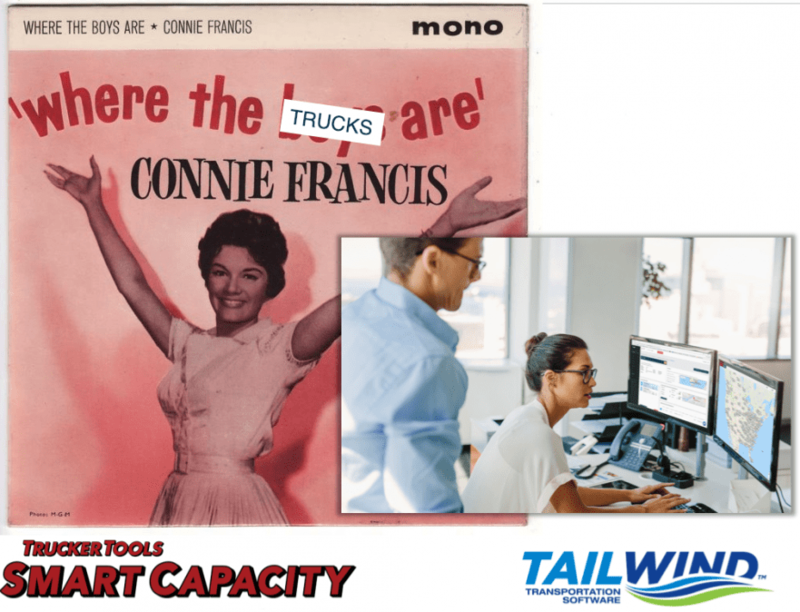 It means that Brokers can have greater visibility of the anticipated availability of other trucks in the Trucker Tools network to cover a load. It means that freight brokers can better identify other possible carriers and trucks that might be available to pick up a load because they know 1) what trucks are in the area plus 2) others that will soon be arriving AND available. No longer are you Han Solo driving the Millennium Falcon, you now have visibility and access to the entire Rebel Fleet! Engender the loyalty of your Carriers because you provide consistent, and contiguous routes. Just last week, Tailwind hosted a Webinar on this new functionality; if you are interested in learning more, you can watch a recording of that session. And while Connie Francis ends her song not really knowing, not really sure, if that ‘special someone waits for me’ – with Tailwind Transportation Software’s new Smart Capacity integration Freight Brokers everywhere will now at least known his time of arrival… and if not, who else might be available!